Jewellery stocks — Titan, PC Jeweller and Tribhovandas Bhimji Zaveri (TBZ) — surged three to six per cent intra-day on Thursday before closing with gains of 0.5 per cent to three per cent. The rally was fuelled by the Reserve Bank’s announcement that banks could give gold on loan to jewellers. RBI also removed restrictions on import of gold coins. These moves follow removal of the 80:20 scheme (requiring jewellers to export 20 per cent of the gold they imported) in November 2014. These curbs were introduced in August 2013 to keep gold imports in check, which in turn was targeted to support the rupee and to address the current account deficit. Wednesday’s announcements will favourably impact jewellery companies' profitability, as their funding costs will come down, along with the need to pay cash upfront. However, the gains will vary, depending on the amount of current contribution from this scheme for each company. Stocks gave up the initial gains as a lot of these positives were already factored in. For instance, the gold-on-lease scheme was approved two to three quarters earlier, though it did not take off on-ground, due to lack of clarity among Customs authorities. The Titan management had complained about this to RBI. The new development means these issues have been addressed. With return of gold-on-loan, companies that earlier incurred interest costs of as much as 10 per cent on the amount invested in funding gold purchases for doing business will have to pay 4-4.5 per cent to banks for taking it on loan. This will enhance the return on capital employed (RoCE) of jewellery companies, believe analysts. Also, gold-on-lease acts as a natural hedge for gold price volatility. Companies that were hedging their gold exposure, internationally or through local commodity exchanges, will not be required to do so, leading to further cost saving. The curbs had impacted companies significantly leading to higher interest costs and lower return ratios. From almost zero in FY13, Titan’s debt grew to Rs 806 crore in FY14, that of PC Jeweller grew four times to Rs 1,004 crore and TBZ’s grew 35.5 per cent to Rs 568 crore. As a result, Titan's interest cost grew 72 per cent year on year to Rs 87 crore in FY14, PC Jeweller was up 19 per cent to Rs 152 crore and TBZ’s was up 107.6 per cent to Rs 52 crore. 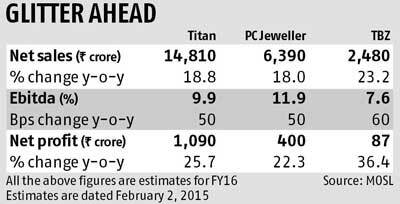 For this financial year’s first nine months ended December 2014, Titan’s interest cost was up four per cent, PC Jeweller by 61.4 per cent and TBZ’s by 14.8 per cent, over the year-before period. Consequently, Titan, PC Jeweller and TBZ’s RoCE had compressed by a whopping 2,220 basis points (bps), 760 bps and 460 bps, respectively, to 14.9 per cent, 26.7 per cent and 37.2 per cent in FY14. In FY15, too, analysts expect these companies to witness RoCE contraction of another 200-400 bps. However, FY16 will see expansion in this metric by 150-300 bps as the gains from removal of these curbs start reflecting. In FY17, the return ratios are expected to rise by 200-300 bps. Operationally, the premium on gold in the domestic market could come down, making gold sourcing cheaper. With less restrictions, companies will also be able to increase the pace of expansion. On the flip side, the demand for gold (including coins, etc) as an investment might not see a surge, given the weak gold prices in the past two years, falling inflation and better returns in other assets such as equities and debt. 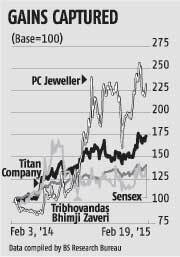 In this backdrop, most analysts remain positive on jewellery companies but prefer Titan in this space, given its strong brand positioning and larger size.